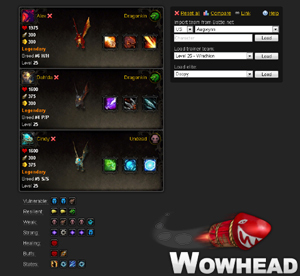 Wowhead recently released a new awesome resource for pet battlers! The Battle Pet Team Calculator allows you to preview and create teams, view strengths and weaknesses, as well as potential buffs. You can take a look at any player's active pet team by simply inputting their region, realm, and character name. For many player obtained pets, the stats and quality can be adjusted. The Battle Pet Team Calculator doesn't stop just there, though. This tool also has the ability to show you NPC pet teams, including those in the new Celestial Tournament. This will come in handy when preparing for future encounters in the tournament! Curious about how one pet will affect the synergy of your team? Create and preview your own customized pet team even if you're not in-game. By loading your character, you can remove or add any pets to your team from your collection. Preview your team's strengths and weaknesses even before battling with it! For more information on Wowhead's Battle Pet Team Calculator, check out their guide on how to use this amazing tool.